KATHMANDU, July 3: After the CPN-UML emerged victorious in provinces 3, 4 and 6 in the first phase of the local polls, several leaders of the ruling Nepali Congress and CPN (Maoist Center) stood in defense of their parties' performances, arguing that the outcome was not that much unexpected given UML's sway in the provinces. Leaders from both parties claimed that their parties would compensate the loss incurred in the first phase with elections in tarai and far- and mid-western regions of the country. But weeks later, it's becoming increasingly clear that the second phase of local elections has been hardly any different for the ruling NC and Maoist Center in terms of electoral gains. Vote count for the second phase of local elections shows NC and CPN (Maoist Center) trailing behind UML respectively in the second and third position. Until Sunday, NC and Maoist Center have registered victory in 76 seats and 28 seats respectively, compared to UML's 91 seats. Irrespective of whether the parties succeed in making a comeback in Province 2 that is planned to go to polls on September 18, NC and Maoist Center have little reasons to cheer for the outcomes of the first two phases of local polls, leaders said. “Our party has not yet made any official view on the outcome of the elections. But we are definitely not happy with our overall performance,” said Maoist Center spokesperson Pampha Bhusal. Bhusal said that she was especially concerned with the party's performance in the eastern region and urban areas. “I think rumors spread by the main opposition also affected us in some ways. Additionally, money also became a big attraction in this election,” said Bhusal. 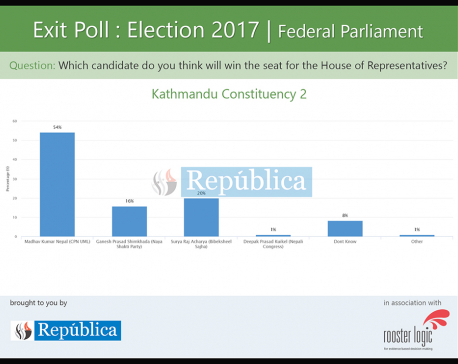 The poll result has come as an even bigger setback for NC, which is in charge of the government. The party tried its best to mobilize power and resources at its disposal to sway the polls in its favor. It also did everything to check UML's advance in the second phase of local polls. The party formed alliances with other parties in hundreds of local units to ensure victory in core constituencies. Despite all this, the party failed to produce the desired results. “The party undoubtedly suffered a setback in these elections. There were hopes for better results especially in Province 1 and Province 2,” said NC Chief Whip Chinkaji Shrestha. Stung by the party's poor performance, the NC headquarters has already directed the lower committees to clarify on its defeats in constituencies where it had hoped to win. “The reports submitted by the district chapters suggest that intra-party betrayal was the main reason behind our loss. There are some other factors too but the intra-party feud was the main reason,” said Shrestha. NC leaders appear especially worried about the party's dipping popularity in its core constituencies including in the tarai belt and eastern region. It is equally concerned about UML's growing influence in the far western region in the backdrop of the nearing elections of the provincial and central governments. The UML leadership, by far, looks the happiest lot at the moment. Leaders said that the party will produce similar results in the third phase of local elections. “We are satisfied will the results though we still believe that our party could have done much better than this. We are hopeful of better performances in the elections of the provincial and federal governments,” said UML Secretary Pradeep Gyawali. Gyawali said numerous factors including the party's stance on constitution, strong organization and candidate selection boosted the party's performance. “One reason why we are very optimistic about the elections for the provincial and central government is it will be difficult for the ruling parties to isolate us. They won't be able to form alliances against us due to the limited number of seats,” said Gyawali.